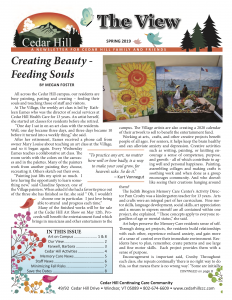 Spring is springing and we are pleased to share our Spring 2019 issue of “The View,” a new quarterly newsletter from Cedar Hill. We hope you will find this an enjoyable and useful read. Our intention is to improve communication and foster community across our campus. 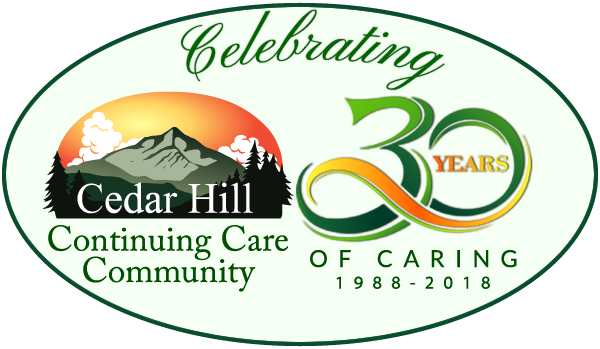 Life at Cedar Hill – or any long term care facility – is about far more than the nursing care we provide. It is about the life you lead when you live here. Whether it is the art programs we run on campus, the book clubs, the volunteer-led activities, the singers, or the animals we host, our “Activities” Departments truly work to enrich our residents’ lives, assisted by all of our other staff and volunteers and families. And in turn, all that fun enriches our staff and families too. All that “other stuff ” feeds our souls and bolsters our health in ways beyond what medicine can do. That is what Barbara Flinn discusses in our interview. She is retiring after 20 years at Cedar Hill, as our Director of Activities at Cedar Hill Health Care. I hope you will take the time to read the articles on our outstanding art programs. We are continually astounded by what our residents, staff, and volunteers create together. And consider volunteering! We always have more we can do.